Quiet House is exclusive to Charlotte Pipe and Foundry, the only manufacturer of both cast iron and plastic pipe and fittings. 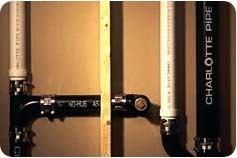 This unique system combines sound-deadening cast iron with economical PVC for a plumbing system that is twice as quiet compared to an all-plastic system, even when the plastic is insulated. It offers a lifetime of quality and quiet for little more than the cost of an all-plastic system. Plus, there's no sloshing, gurgling or gushing noise from behind the walls of your home. Quiet House uses cast iron for waste piping, commonly referred to as the “drops” or “stacks” of the plumbing system. Plastic is used for the vent lines. By using cast iron for the stacks, the sound of water running behind the walls is eliminated. Also, our hubless cast iron fits in modern stud walls more easily than PVC, and there's no need to bypass living areas to reduce noise. By combining these products, homeowners get a system that is both economical and quiet. Cast iron pipe and fittings are made from 100% recyclable content. It has been, and in some cases still is, in use after more than a hundred years of service. 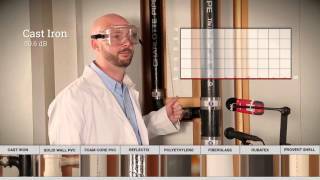 This reliability and quality has earned it a reputation as the premier material for a plumbing system. Our cast iron products meet or exceed industry standards. Charlotte Pipe’s plastic pipe and fittings are highly durable with high tensile and high impact strength. Our lines of PVC, ABS and FlowGuard Gold are easy to install, maintenance-free and corrosion resistant. Plus, all of our products are manufactured to meet or exceed industry standards. For more information on our Quiet House system, download our brochure.